I decided once again to make an easel card (my favourite cards) the problem as I said was what beautiful paper can I use, I decided this one from the new Petunia- Parade Collection available from Bearlymine Designs, I have also used Tilda coloured with promarkers, used my Cheery-Lynn border die and also my leaf dies also from Cheery- Lynn, finishing of with flowers and a few pearls. Hi Laney, What a fabulous card. Love the colours and Tilda is gorgeous, as are the fabulous papers. 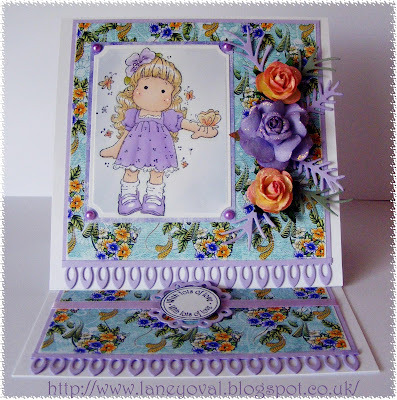 Fab card Laney, I love your gorgeous colours and pretty border die. Gorgeous card Elaine, love how you've used the cuties die along the bottom, and your coloring of Tilda is fabulous. this is soooo adorable!!! LOVE it!!!! Good Luck and thank you for playing along with us at Cheery Lynn Designs! Very cute card, Laney, love how you used the flower die as a border. Good luck and thanks for joining in on the Cheery Lynn Designs challenge blog. Beautiful...she is one of my favorite Tilda's! Thank you so much for joining us at MIM. Don't forget to leave a comment for another entry and mention you saw them on MIM for a chance to win our second prize! Beautiful! Glad you could join us at sweet Stampin' this week. Wow, nice colouring and I love all the layers. Thank you for joining us at Dutch Magnolia Lovers. Very pretty card!! Love the colors and the Cuties as a border. 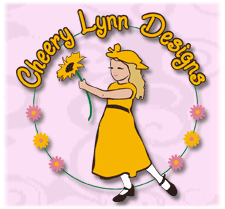 Good luck and thank you for joining us at Cheery Lynn Designs. What a beautiful card! I love this colours. Thanks for joining your card at DML. Unfortunately, you may entry your card in max 5 challenges at DML. What a beautiful easel card! I love how you used the Cuties die as a border! Thanks for joining us at Cheery Lynn Designs Challenge blog, and good luck! This is beautiful. The lovely background paper complements your beautifully colored image perfectly! Very pretty. Thanks for joining in all the fun at the bling challenge for Lets Ink It Up! Gorgeous card. Thanks for sharing with us at LIIU and good luck.